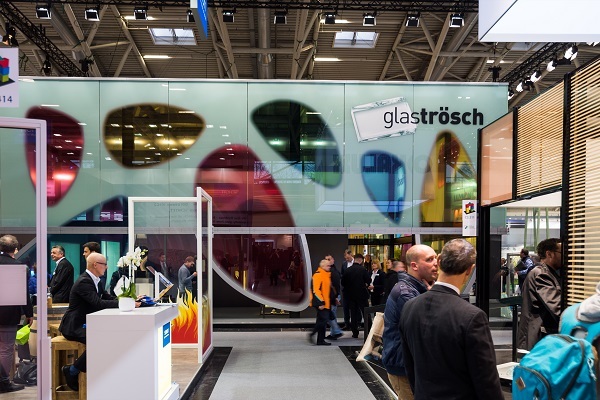 Glas Troesch was attending BAU 2019 with a stylish stand: in hall C3, stand 310, the Swiss glass manufacturer’s wide-ranging product portfolio was “creating space – opening worlds,” the company’s theme this year. 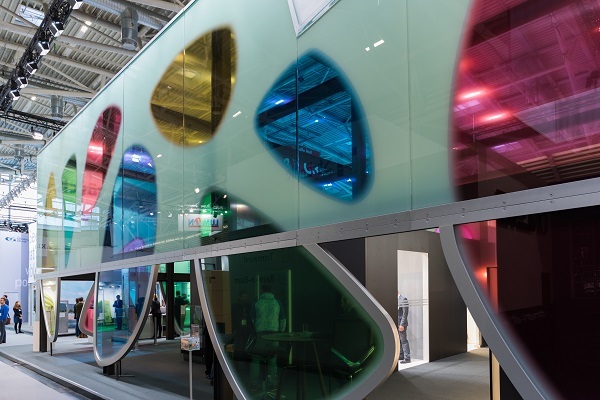 In a colourful glass cube, visitors could immerse themselves in the fascinating world of glass and find out all about the company’s custom solutions for both interiors and exteriors. 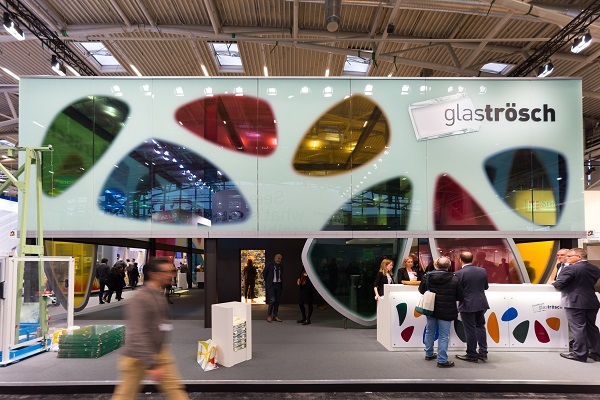 The trade fair stand’s designer shell is a perfect showcase for the transparent material and clearly demonstrates the wealth of design possibilities that glass offers. The cube features a façade that uses triple laminated safety glass with congruent ceramic digital white printing. 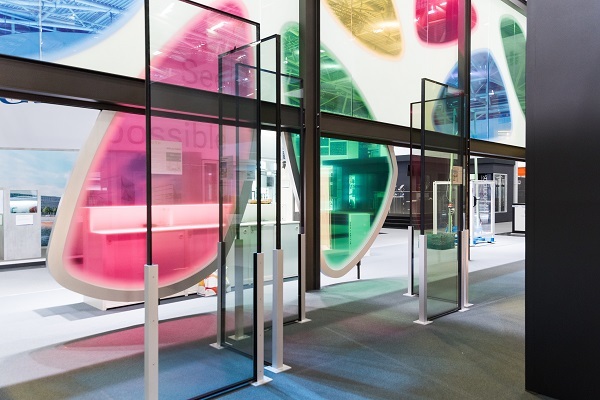 Digitally printed film in a range of colours was used for the transparent oval openings. These differently sized cut-outs add elegant touches of colour, effectively inviting visitors to take a look inside. 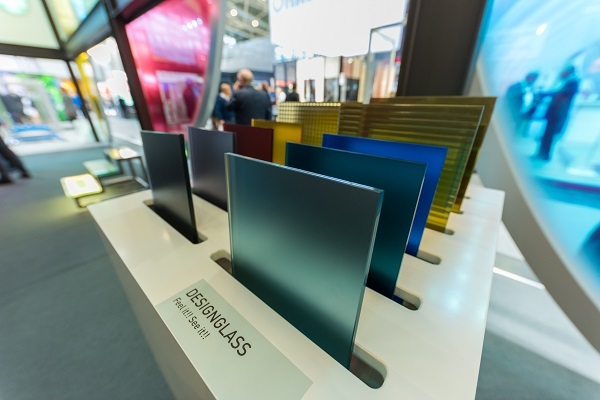 At the centre of this year’s display is the Glas Trösch interior world – opaque, transparent, and reflective surfaces alternate, producing a kaleidoscope of patterns and surfaces. A particular highlight is the SCREENLIGHT luminescent glass, which is just 20 millimetres thick and can now also be used in wet areas. 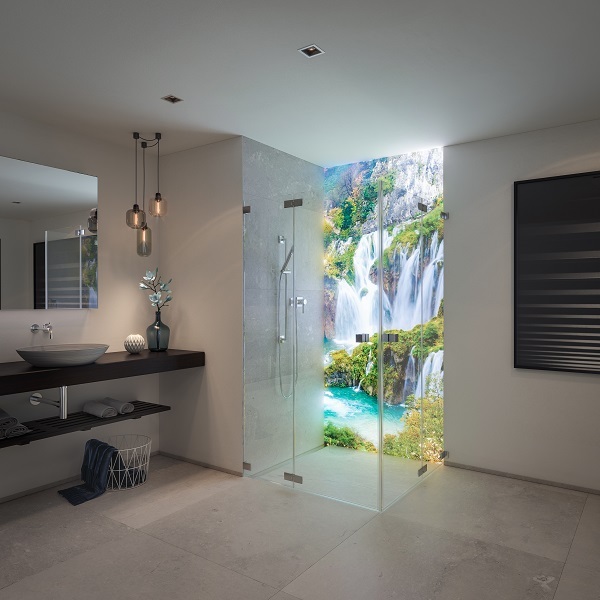 The almost frameless, waterproof, illuminated LED wall displays custom patterns in a unique way and adds a brilliant glow to bathroom settings. Another highlight is the partially mirrored SPY MIRROR, which is combined with technology used in premium 24/7 industrial screens. 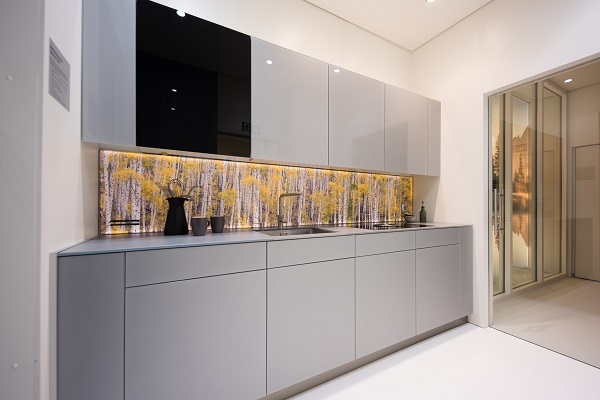 The result is a unique design object: when switched off, the glass provides a touch of elegance as a decorative mirror; switching it on allows effective use of the product as a display medium. Visitors can also view a number of informative films on the subject of glass at the stand. 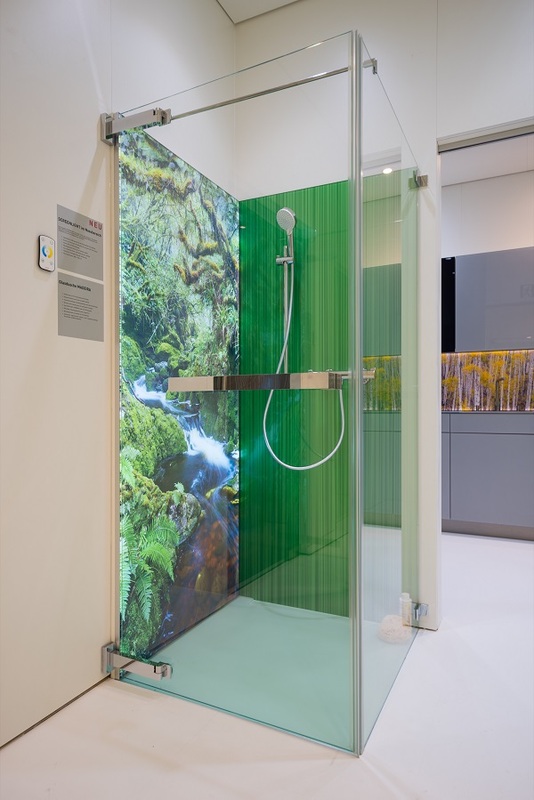 Further glass products for interior use give visitors the chance to take in our wide range of designs and make glass in its various applications a true visual experience. 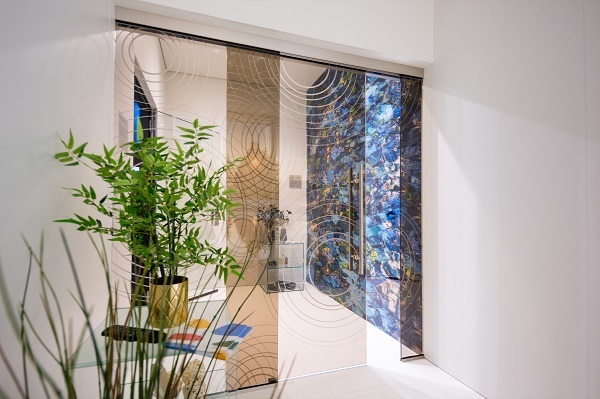 As an example, the LAMEX SATIN decorative glass features a silky shimmer, while various structural glass products are both highly attractive and unique to the touch. 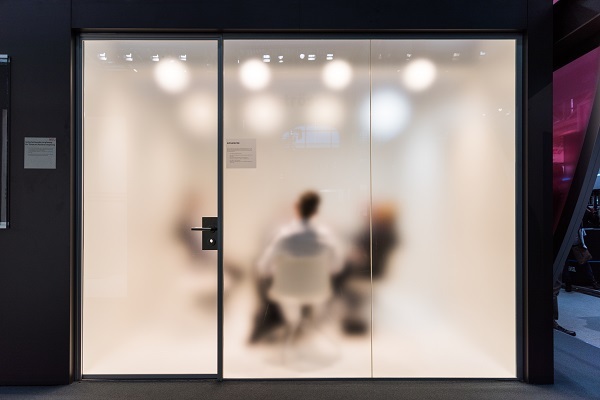 The filigree SWISSDIVIDE ONE glass partition system shows the flexibility with which glass can be used to divide up rooms – the double-sided, totally flush-mounted system elements are completely grid-free and can be used in an extremely wide range of design choices. 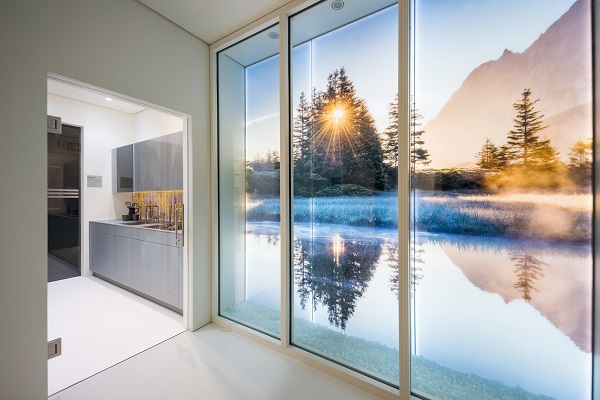 In addition to numerous interior solutions, the company will also be showing special façade glazing with a sophisticated look, such as the shimmering, white SILVERSTAR WHITESHINE low E glass or the SILVERSTAR SELEKT 74/42 thermal insulation glass, which offers maximum colour neutrality. The new SILVERSTAR COMBI Grey 70/35 features an attractive silver-grey hue – this special colour nuance enables planner to design attractive glass façades with a particular look where an extremely uniform appearance is desired. SILVERSTAR ALARM façade glass is ideal wherever enhanced security is required in combination with the desire to retain a modern architectural look with great transparency. 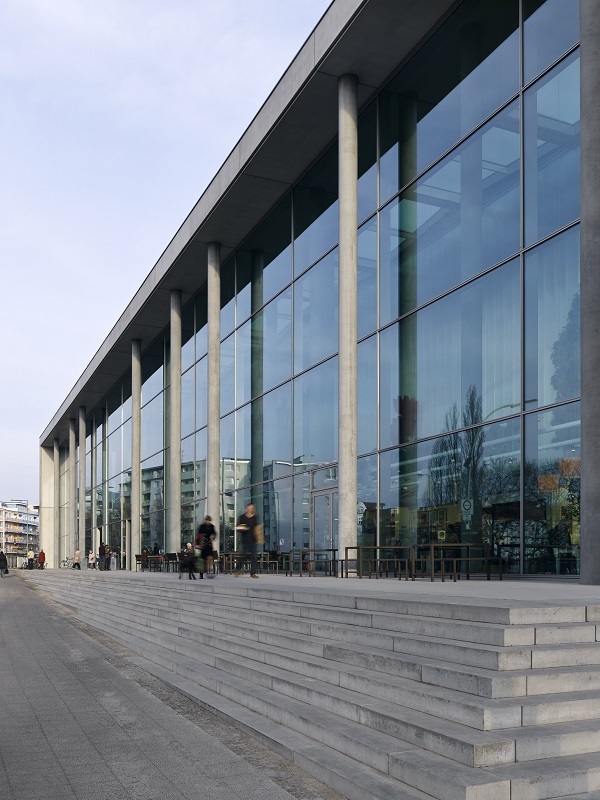 The alarm glass enables the creation of façades that require no further protections such as fencing or grilles. Thanks to the latest iteration of SILVERSTAR ALARM, the alarm-triggering circuitry is now also hidden from view – meaning there are no limits to creative freedom. The trade fair stand will also host a live ball drop test that shows just how robust and safe glass can be.